The Many Adventures of T & A: christmas? bring it! I officially started my Christmas shopping this past weekend and realized something - once Halloween is over, people immediately start thinking about Christmas. Unlike our neighbours to the south, we don't really have a holiday in between Halloween and Christmas. Yes, there is Remembrance Day on the 11th, however, it's not the type of holiday where you get the family together and carve up a turkey. It's usually spent lounging around the house, soaking up the goodness that one can only feel when it's Thursday and you're not at work (unless, you're in the military - more on that later). So yes, most of us moan and complain when we see that stores are setting up their Christmas stock and decorations mid-October. This is definitely how I felt the other day when I spotted my first Christmas tree of the year. 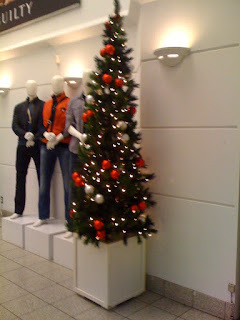 However, I have to admit that I love that the SECOND Halloween is over, the Christmas season is in full swing. I know that a lot of people cringe at the thought of braving the cold (and sometimes snowy) weather and to push their way through a crowded mall in the search of the perfect gifts for their loved ones, but it brings me so much joy. I can't wait until all the stores start playing Christmas music, until our schedules are jam-packed with various festive events, and the best of everything - the Christmas Train!! So, Christmas season starting November 1st? Bring it!